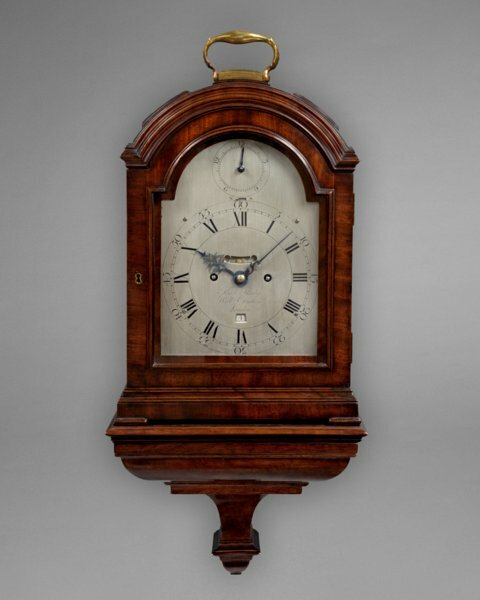 Anthony Woodburn deals in fine antique clocks - 17th & 18th century English antique bracket clocks, longcase clocks and antique barometers, including pieces by THOMAS MUDGE & WILLIAM DUTTON, London. A fine mahogany spring bracket clock of good mellow colour made by the most eminent horological partnership of the George III period. The triple pad top case with brass carrying handle surmounting the centre pad stands 14¾ inches (37.5) high. The break arch brass dial with silvered finish has an engraved roman chapter ring and a subsidiary dial in the arch indicating rise and fall regulation. Between the two dials is a strike/silent option and a false pendulum aperture beneath 12 o’clock. Above six o’clock is a small aperture to view the day of the month. The dial is signed by the makers, Thomas Mudge & William Dutton, London. The substantial two train fusée movement has five knopped pillars separating the plates. The escapement is anchor with rise and fall regulation and the back plate is boldly signed by the makers. The number 281 is stamped on the top outer edge of the back plate. The clock is complete with a later contemporary bracket with pull forward drawer to house the keys. Close examination of the movement reveals the originality of the wheels, arbours and pinions.